Jennifer Jurado, the chief resilience officer for Broward County, spoke to an audience about the benefits of solar energy in Davie Wednesday morning. Broward County homeowners who are interested in installing solar panels now have a chance to buy in to renewable energy. Members from climate change advocacy groups gathered at the Young At Art Museum in Davie on Wednesday to announce the launch of a new solar co-op. The co-op allows a group of homeowners to join together to purchase solar panels in bulk, which costs less money than purchasing panels individually. "By getting a group of homeowners together and selecting one installer, an installer can place orders of quality products in bulk, and they pass the savings on to the homeowners," said Jody Finver, the South Florida Program Coordinator for the nonprofit Solar United Neighbors of Florida, which is organizing the co-op. Supporters say that installing solar panels gives people the ability to reduce their carbon footprint and help reduce contributions to global warming and sea-level rise, in addition to energy bill cost savings. People are able to offset different percentages of their energy bills depending on how much energy they use in a year, and how large their roof is. Natalia Ortiz, the development director for one of the co-op program partners, The CLEO Institute, recently installed solar panels on her own house. "In addition to the fact that I no longer have an astronomical [Florida Power & Light] bill, the property value went up," Ortiz said. "Climate change is here, the impacts are real," Ortiz added. "Join the solar co-op and be part of the solution to mitigate climate change, because we do have a responsibility." 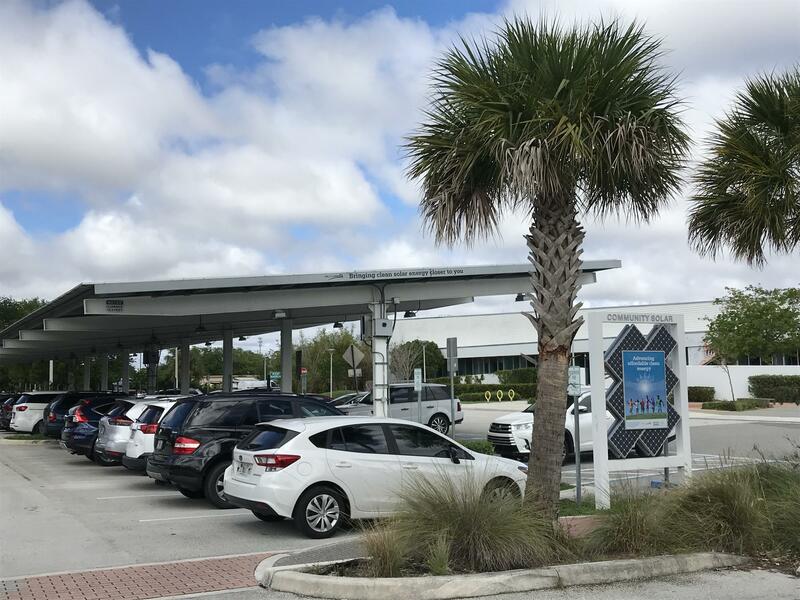 The car port at the Young At Art Museum in Davie harnesses solar energy to charge electric cars. In 2017, the first Broward co-op with Solar United Neighbors saw more than 40 homeowners band together to install solar panels - either on their roofs, or on car ports. A solar co-op organized by the same group also started in Miami-Dade County in September last year. 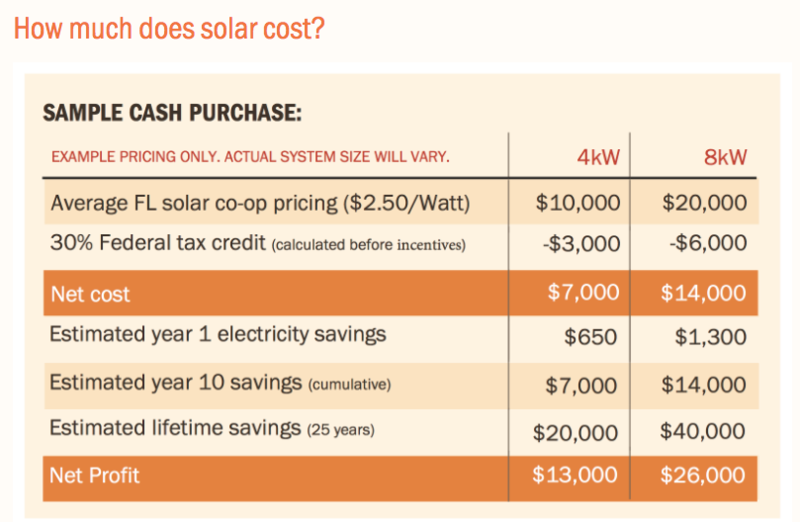 A typical timeline for a solar co-op process is between four to eight months, Finver said. Solar United Neighbors will be hosting information sessions for interested Broward homeowners. The sessions will review the Florida Solar Rights Act, which prohibits an entity - including neighborhood or condo associations - from stopping residents from installing solar panels on their residences. The average cost of installing solar panels on a home, according to Solar United Neighbors of Florida. The sessions will also review different types of financing options for installing solar panels, which include: financing through the installation company; taking out a solar-specific bank loan; taking out a loan through the nonprofit SELF (the solar and energy loan fund); or using the Property-Assessed Clean Energy program, which tacks the cost of the panels onto property taxes. There's a 30 percent federal tax credit offered for installing solar panels this year. But it gets reduced next year to 26 percent, and then 22 percent after that. As soon as 30 homes sign up anywhere in Broward, the co-op can begin to take bids for a company to install panels. "Whether you're offsetting 100 percent [of your energy bill], or 80 percent, or 75 percent or 50 - it's all a win to harness the sun," Finver said. April 2, 2019: 6 p.m.
April 16, 2019: 6 p.m.
May 21, 2019: 6 p.m.
May 22, 2019: 6 p.m.